Buttery caramel sauce and tender chunks of fresh apples rolled between layers of sweet bread. Now that the weather is starting to cool down, I’m beginning to crave warm, cozy meals. I’m no longer reaching for overnight oats and cold cereal for breakfast. I’m on to bigger and better things: cinnamon rolls. I’m usually quite predictable in the morning, reaching for the container of steel-cut oats and a jar of apple butter for my usual bowl of hot oatmeal. On occasion, I like to splurge and make a stack of these Orange Pumpkin Pancakes or a few mammoth-sized Funfetti Waffles. Splurging usually occurs on a Saturday or Sunday morning when I have more time to dedicate to breakfast happenings. With the holidays quickly approaching and apple season in full swing, I decided to make something extra special that will serve a crowd (i.e. my sweet-loving family), and so these Caramel Apple Cinnamon Rolls were born. I used the sweet roll dough from this recipe for Nutella & Toasted Pecan Sweet Rolls. The dough comes together easily and can be made 2 days in advance. The addition of Red Star Yeast guarantees the perfect batch of cinnamon rolls every time. I usually make my dough the night before I’m going to serve the rolls. On the following morning, I roll out the dough, layer on the ingredients, and bake the rolls. One batch of sweet roll dough will yield 12 big, fat cinnamon rolls. I can taste them now! 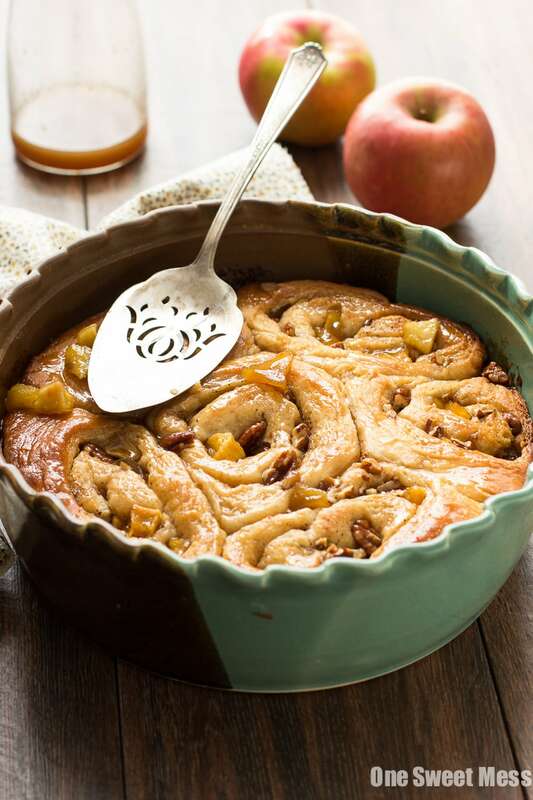 For this recipe, I stuffed the sweet roll dough with a quick caramel sauce loaded with local apple chunks, brown sugar, and toasted pecans. Before layering on the ingredients, the dough gets brushed with brown butter. Can I get an AMEN? They bake up puffy, golden brown, and oozing sweet caramel goodness. As if that wasn’t enough deliciousness, extra caramel sauce gets poured over the top of the rolls while they’re still warm. In a large pot over medium-low heat, whisk together milk, sugar, and oil. Using a candy thermometer, heat the milk to 120 degrees F. Sprinkle the yeast over the top of the warm milk mixture. Stir in 3 1/2 cups of flour. Take off the heat and cover the pot with a clean towel; allow the dough to rest undisturbed for 1 hour. Add the remaining 1 cup of flour, salt, baking powder, and baking soda to the mixture. Stir until combined. Place the lid on the pot and refrigerate until the mixture is completely cool (the dough is easier to handle if it is refrigerated). Preheat the oven to 375 degrees F. Butter a 9-inch-by-13-inch baking dish, or two 8-inch pie plates or round cake pans. Remove the dough from the refrigerator. Turn the dough out onto a lightly floured surface. Roll the dough into a large rectangle, about 24 inches long and 10 inches wide. Brush the dough with 4 tablespoons of brown butter (instructions below). Drizzle 2 cups of the caramel sauce over the dough. Sprinkle the brown sugar and toasted pecans over the caramel sauce. Starting at the side farthest from you, roll the dough towards you, until it resembles a log. Pinch to seal. Turn the dough over so the seal faces the work surface. Slice into 2-inch thick rounds and place in the baking dish cut side down. Cover the baking dish with a towel and allow the rolls to rise for 15 minutes. Place in the oven and bake for 30-35 minutes, or until the rolls are golden brown in color. Allow the rolls to cool for 10 minutes. Drizzle the remaining caramel sauce over the warm rolls. Peel, core, and chop the apples into 1/2-inch chunks. Heat 2 tablespoons of butter in a skillet over medium-high heat. Add the apples and cook, stirring often, until tender, about 10 minutes. Transfer the apples to a bowl and set aside. Add the remaining butter, brown sugar, and honey to the pan. Bring the mixture to a gentle boil and continue to cook, whisking constantly for 2 minutes. Slowly whisk in the heavy cream. Bring the mixture back to a boil. Cook, whisking constantly for 2 minutes. Stir in the apples. Continue to cook, stirring constantly, for 2 minutes. Remove the pan from the heat and stir in the vanilla, cinnamon, and kosher salt. Transfer the mixture to a heat-proof container. Cover and place in the refrigerator until the mixture is completely cool. When you’re ready to use the caramel, give it a good stir. Melt the butter in a saucepan over medium heat. Continue to cook the butter, swirling the pan occasionally for even cooking, until the butter is a dark golden brown color and smells nutty. Allow the butter to cool to room temperature before using. Disclosure: Thank you to Red Star Yeast for sponsoring this post. All opinions are 100% my own. Thank you for supporting my site while I work with brands I use in my kitchen. I am in love with these!! SO pretty. oooooh pure comfort!!!! I can just imagine how wonderful these cinn rolls must smell! So delicious! Love the fall flavors that make these sweet rolls so irresistible! These look so good! Wish I had one in front of me right now! How did you know that I love cinnamon rolls so much? I can’t wait to eat these! I think I need these in my life! #1 – I’m jealous of your cool weather! We’re STILL in the 90’s in So Cal :( #2 – I’m beyond jealous of your breakfast! These cinnamon rolls look absolutely divine!! #3 – I want your baking dish! So stinkin’ cute! I adore Red Star Yeast—it’s all I use! And these rolls??? Utterly delicious!!! Woah, these look divine!!! Perfect weekend breakfast, might have to treat myself! Those look insanely good. And Red Star yeast is the best! Yum! I want this for breakfast! What’s not to love about these cinnamon rolls??? Caramel and apple make everything better!